What direction should a ceiling fan go? What direction should ceiling fans go? East Idaho has some pretty dramatic temperature changes. Winter can be very cold and summer temperatures can easily get into the upper nineties. Adjusting your ceiling fan for the season can make your home feel better, reduce drafts, and help you moderate your heating and cooling bills. Here is what you need to remember. Stand under the outside edge of one of the ceiling fan blades. Look at the center of the ceiling fan and then find the 12 o'clock position. In the summer, your fan should be spinning to the left and the air flow should be pushed down. By pushing the air down, you are mixing the warm air with the cool air and creating a downdraft. When this downdraft hits your skin it has a cooling effect. Running your ceiling fan counterclockwise in the summer can reduce your cooling bills by as much as 40% for the area influenced by the fan. To adjust your ceiling fan for winter use, you want to make sure that the fan is pulling cool air from the ground forcing it through the warmer air on the ceiling and then over to the walls and down. As the cool air hits the very warm air on the top of the ceiling, it is warmed. Once warmed, the airflow pushes the warmed air to the outer walls of the room where it is forced down. Creating this type of circulation, where the warm air hits the walls, has the opposite effect of the summer fan settings. In this case you do not want to feel the draft of the fan because that will make your skin cool. Stand under the outside edge of one of the ceiling fan blades. Look at the center of the ceiling fan and then find the 12 o'clock position. 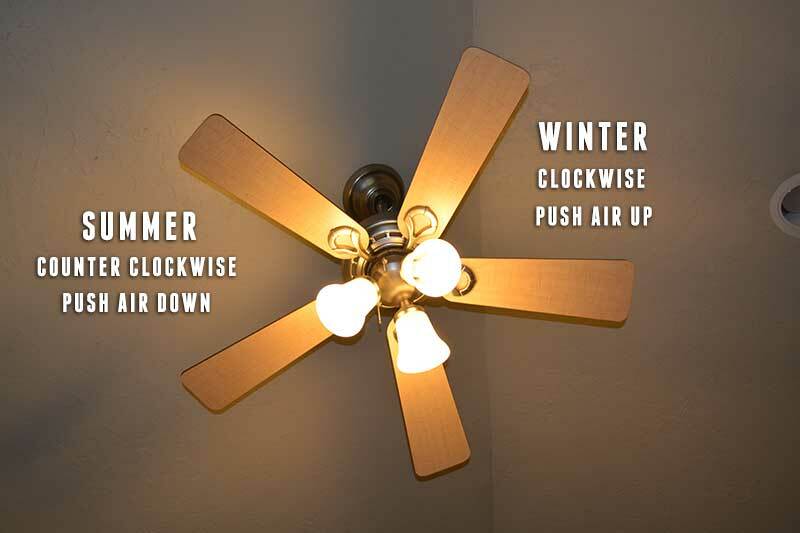 In the winter, your fan should be spinning to the right and the airflow should be pulled up and then over to the walls at the ceiling. In the summer the fan speed should be medium to high so that you create a cooling breeze on your skin. In the winter you should place your fan speed on slow so that air is moving but does NOT create a breeze.